I think there were several years when all my aunt, Sissy, was told to bring to family gatherings was her delicious bruschetta! Sissy is one of those incredible cooks who can look at any number of ingredients and in her mind be making up a million different recipes. She is creative, graceful, and brilliant in the kitchen as she is in the rest of her life. She is a gift to me and to our entire family and I count my blessings that I have been abe to learn from her, not only in the kitchen, but in life as well. I hope you enjoy this delicious summertime dish that is a hit at any party! Chop tomatoes and basil. Cut the french bread into 1/2-inch slices. Brush each piece of bread with a little bit of olive oil and toast in the oven. 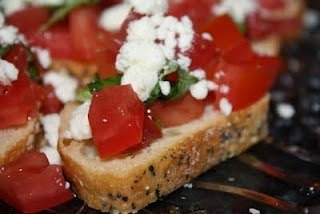 Remove from oven and top with tomatoes, fresh basil and feta cheese. Drizzle dressing over each piece. Note: This dressing is delicious on any salad as well!